Supporters make a life-changing and life-saving difference for women, teens and couples experiencing unexpected pregnancy. Abria offers trusted information, builds confidence and provides a message of hope, personalized for each individual we serve. Abria does this by providing free, comprehensive and medically accurate information and life-affirming medical and personal support services that empower our clients to make a choice for life. Abria doesn’t tell clients what to do; we help them find the answers for themselves. We are a community-based non-profit organization, with 95 percent of our funding coming from hundreds of donors throughout the Twin Cities. We rely on these supporters to put a choice for life within reach of local women, teens and couples. Find out more about our mission. We have chosen to open our doors in the heart of the Twin Cities, in locations easily accessible by car or public transportation and in the two counties that are home to more than half of the Minnesota women and teens who received abortions in 2017. See our history. Accessibility to those who need us most is only part of our story. Awareness of what we do and how we can help clients make the right decision for themselves is essential. We reach out to potential clients online, where they are looking for answers, to connect with them at the moment of decision. Then, we walk with clients every step of the way to support their choice for life: throughout pregnancy and during the first two years after the birth of their child. Learn about our unique services. Another aspect of our approach that really makes us stand out: lasting impact. We provide services that will make a difference in our clients and their children’s life long after they walk out our doors the last time. Certified life coaches help our clients empower themselves through good decisions and belief in themselves to choose a better future. We inspire our clients, giving them the tools they need to build a better life for themselves and their children. Share our success stories. 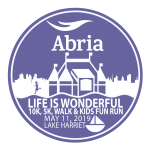 In addition, Abria’s, educational outreach initiative, LifeEdge Solutions, assists local young people in creating a personal vision built on positive and healthy choices that lead to success in life. Learn more about LifeEdge Solutions. Abria serves the entire person: intellectual, emotional, spiritual and physical. We respect the dignity of every person we serve – starting with the individual in front of us. Our holistic approach, rooted in belief in the inherent value of each unique person, inspires and supports our clients in a choice for life.